Want delicious, high quality Italian goods delivered to your front door from Florence? Join our Food Club! Continue your Italian adventures with a gourmet box of hard-to-find gold quality Italian ingredients or a craft Negroni cocktail kit we personally curate. 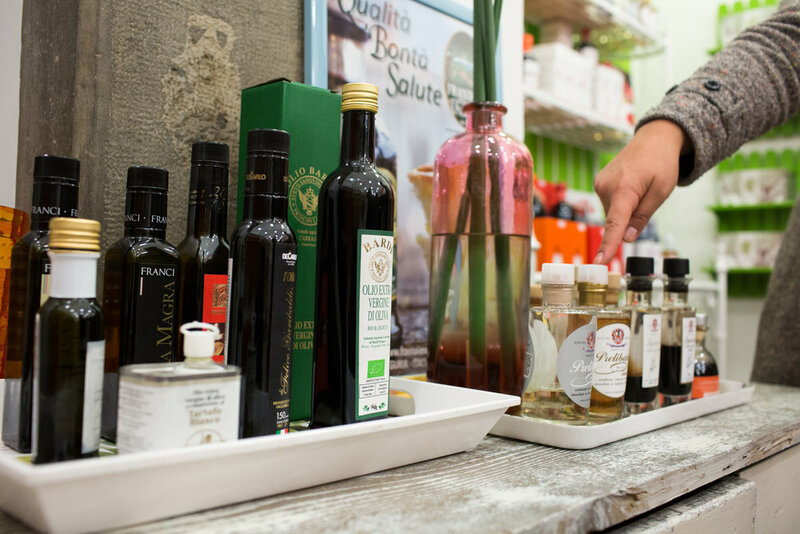 We select only the finest extra virgin olive oil, aged balsamic vinegar, truffle goods, parmigiano-reggiano from prized heritage cattle vacche rosse, pasta and more! Our mailings are seasonal and your box will change accordingly. We source from tiny producers to give you exclusive access to authentic, artisanal Italian products! Perfect for chefs, avid cooks, holiday and special occasion gift-giving. Devour countless Italian flavors from Florence complete with our personal touches. Details and cost: Our Gourmet Club offers a Food Lover's Box which is a one-time mailing (no joining costs nor commitment) including the following Italian specialties: Estate extra virgin olive oil, truffle delicacies (salts, honey, paste, etc), Italian roasted coffee, aged balsamic vinegar from Modena, farmstead pecorino cheeses, 36 month aged Parmigiano-Reggiano from vacche rosse, seasonal specialty (i.e. dried porcini or marinated artichokes) fruit compote, artisanal pasta, award winning Tuscan-made chocolates, Calabrian chili and a couple other surprises! (14 products total). The Food Lover's Box has a fixed price of $350USD and the Negroni Box $375USD, both including international shipping. WE ALSO HAVE A NEGRONI CLUB! Florence is the birthplace of the Negroni & our Negroni Club is a curated kit of all you need to make Italy's iconic aperitivo cocktail to serve at holiday parties or to personally enjoy with your home-made aperitivo spread. The club is complete with a recipe developed by one of Florence's leading barmen Julian Biondi, winner of Florence Cocktail Week, drink journalist for Bargiornale & libations expert. The hard-to-find spirits & liquors we include are from small-batch, independent distilleries with little to no international distribution- nothing industrial or mass produced in our Negroni box! Provisions to equate to 20 Negroni! Perfect for holiday get togethers! Our 5 star personal touches! Cost: $375(usd) INCLUDING SHIPPING, recipe, tools, liquors & spirits enough for 20 Negronis, info & fact sheet to the distilleries and personally developed recipe by one of Florence's award winning mixologists. Details: This is a one time subscription, but you can request additional boxes throughout the year and we will rotate craft distillations & liquors. The Negroni Club is available also to those who are not apart of the food club. Shipping is quoted for 2 weeks. Restrictions: We are unable to service thirsty clients in Utah or anyone under the age of 21. Payment will be requested once we receive your order form as costs depend on your selection (i.e. Level 2, Negroni Club, etc), all payments are requested via PayPal and are subject to a small online processing fee. Which level are you most interested in? * Seasonal Themed Box (Valentine's Day Food Lovers) Level 1 Pantry Essentials Level 2 Curious Culinarian Level 3 DOP Luxury Treasure Chest *NEW* Negroni Club!